An oval crowned Red Maple, that colors later in the fall than 'Sun Valley'. The fall color is bright red and long lasting. A male selection with good potato leaf hopper resistance. 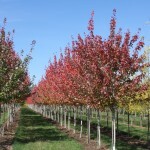 A U.S. National Arboretum introduction, it is a cross between 'October Glory' and 'Autumn Flame'. It is adaptable to a wide range of soil conditions, preferring slightly acid, moist soils. Does best in full sun.